The water quality issues encountered in Worcester County are not unlike most of the other counties, however, there are areas that are known to experience above average rates of arsenic in water and radon in water, such as Harvard, Bolton and Berlin. For example, according to the DPW in Harvard, approximately 20% of private wells contain unhealthy levels of arsenic with an even higher percentage with high levels of radon in that town. Towns such as Grafton, Southborough, Shrewsbury and Northborough have the typical high iron in water, manganese in water and low pH that we commonly find in New England’s well water. Water filtration and/or water softener technology to remove these contaminants from water is very effective in providing safe, clean water. To determine the most appropriate water softener or water filtration system, an initial water test must be performed to identify which contaminants must be removed and at what levels. For more information about Radon in water in Harvard, Bolton, Berlin and other towns in Worcester County, see the following link http://county-radon.info/MA/Worcester.html. For more information about arsenic in water, see the link at Arsenic in Drinking Water. Water softeners, radon removal systems which work with agitation and venting, arsenic removal which is done with an arsenic specific type of resin which “grabs” the arsenic in water and reverse osmosis systems are recommended for the various water contaminants. 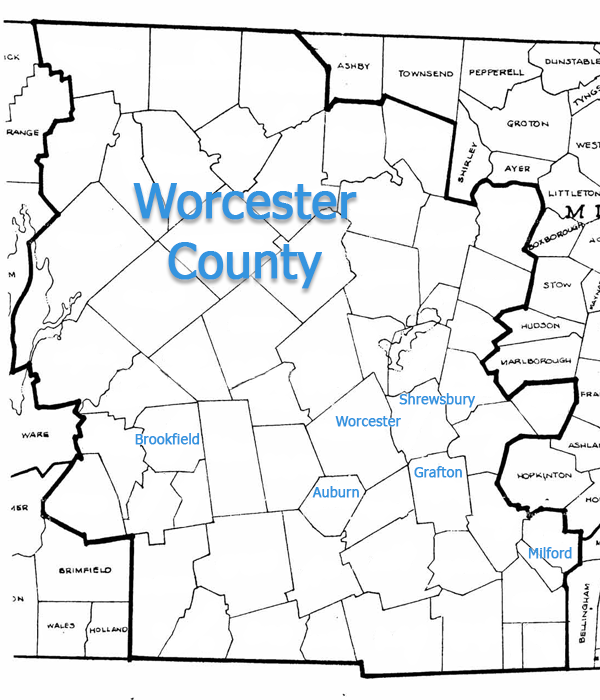 Worcester County is the second largest county in Massachusetts by area and population, hosting the second largest city in Massachusetts and New England, the City of Worcester. Some interesting past and current residents include, John Adams, our second President, who taught in the Worcester school system, Clara Barton, founder of The Red Cross, born in Oxford in 1821, John Chapman (“Johnny Appleseed”) born in Leominster in 1774 and Abbie Hoffman, Sixties radical – born and raised in Worcester, 1937, to name a few.